I have nothing against books, even textbooks. In fact, I am convinced that it's plausible for a teacher to set up a course to follow a textbook and prepare kids for the 21st Century. But that is no small task with a class full of kids wired for a connected world, and there are very few teachers up for it. Once upon a time, pen and paper were the way we recorded everything. Business ledgers, journals, work schedules, and gradebooks, to name a few, were all done with paper. It was a different time. Some say it was better. The fact of the matter is that we are never going back to that. Like it or not, we will always be moving in the direction digital technology takes us. 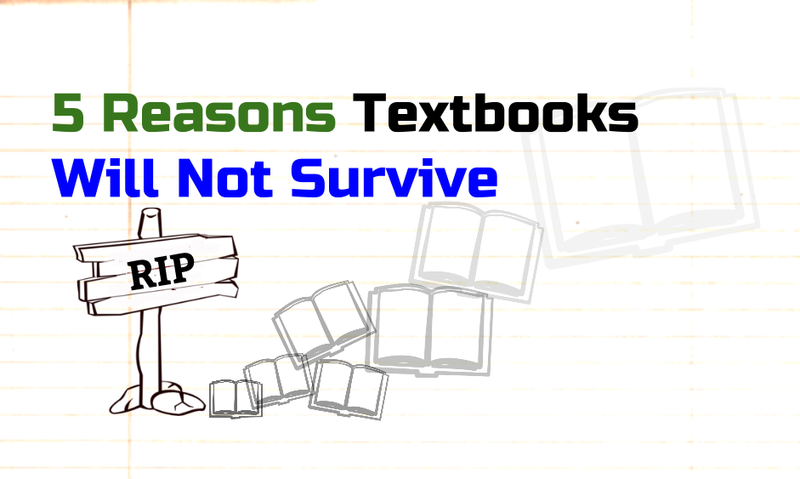 Textbooks will not survive the 21st Century. I don't even think they'll survive the next five years. And the attempt that textbook companies are making in the direction of online resources is deplorable. I know teachers who have made better sites in their free time. From my perspective, the end of textbooks is quite clear. To reflect on why this will happen, I've made a list of reasons. Textbooks cost too much money, especially when everything you'll find in a textbook can be found online for free. And don't start with me about how untrustworthy Wikipedia can be – it's more accurate than Britannica and larger than the Yongle encyclopedia. Plus, there are so many free resources created by experts for the purpose of providing information to the average person. In many cases, these sites are designed with students and teachers in mind. Why not use them? Chromebooks require electricity and will one day end up in an waste recycling facility – if not off the West coast of Africa. But if you add up the carbon footprint of learning with paper versus digital devices connected to the Internet, you'll find that the paper has a higher environmental cost. Remember, recycling requires lots of fossil fuels, and copiers use energy. I could keep going with factors, but I think you get it. Think about the fact that a textbook is only one book. A device connected to the Internet is so much more than even a library of books. The World Wide Web is so vast that the most popular search engine was named Google. Can't remember what a google is? Google it! The amount of books needed to keep pace with the Internet is unfathomable and certainly bad for the environment. We do not access information in the same ways anymore. Sure, while you read through this list, someone is sitting at a table in a library with a book. But most of the connected world will search the Web for information when a question comes to mind. The days of the mother's myth are gone. Kids can find information on their own, which is exactly why educational institutions need to support them. Speaking of myth's, kids are not tech savvy. They don't know this stuff. They don't know what SQL, https, or HTML5 stand for. Most search engine users don't even know how to conduct an effective search. Too many clicks. My students hate it when a resource isn't just a few clicks away, never mind having to go to a library or carry books to school. I try to make it so my students are no more than two clicks to content. Online textbooks, however, are a mess. Most of the online textbooks are three to four clicks to content, and the newer platforms are not trustworthy when it comes to digital assignments. 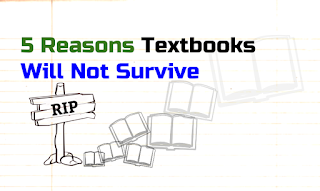 We have Google Drive and many amazing LMS platforms, so there's no need for online textbook assignments with software made by a book company struggling to survive the last days of its existence. Matt Miller wrote Ditch That Textbook. I loved idea when I first started perusing his website, which is full of solutions for classrooms. For example, Matt shares links to Google Drawing templates among other things. I particularly like his ideas about how to use Google Slides in different ways. The vibe is very much about promoting student-created materials versus completing a worksheet. We like to make stuff. With all of the online word, image, and information processing tools in the Google Apps Suite, why would we use textbooks? We can make our own books with classrooms across the hall, or even the World. After all, we are trying to prepare the youth for a world that doesn't exist. They'll need the skills to make things – solutions to problems placed before them or, better yet, problems they found on their own. Bottom line: Why would we set up conditions for learning that do not relate much to ways people learn and work outside educational institutions? Textbooks do too little, too late for this issue. I've tried to continue to find value in textbooks, but it's a tougher and tougher argument to sell. So I'm done.